It has been a disappointing 6-10 start for the New York Knicks thus far in the 2011-12 NBA season, one that began with high expectations after last season's playoff berth as well as a full season with Carmelo Anthony. The fans are angry and it appears that the days are numbered for head coach Mike D'Antoni. So what exactly is wrong with the Knickerbockers and is Mike D'Antoni done? In almost a complete flip from last season, and much of the teams that Mike D'Antoni has coached in Phoenix and New York, it is the offense that is the problem while the defense has been solid. The team has the second best defensive rebounding percentage, one of the top reasons why Tyson Chandler was brought in and his prescence has been a big reason why the team has improved in that regard, and has the eleventh best defensive rating, which is an estimate of points allowed per 100 possessions. They have also improved from 105.7 points per game last season to giving up 95.2 points per game. (Stats courtesy Basketball Reference). But like I said, the offense has not been good this season. Zach Lowe of The Point Forward had an excellent piece on why the Knicks offense has struggled. He says that the Knicks are running isolation plays too much and are doing a terrible job at it, which is mostly the fault that the team has no point guard right now. Toney Douglas and rookie Iman Shumpert have shown they are not natural points and Mike Bibby has been atrocious. The team awaits Baron Davis' return from injury in the hopes that he can help right the ship but in the meantime the club has been using Anthony as a point forward. Anthony hasn't been a terrible point foward but it's simply not his game. Also you can note the offensive struggles are also due to the team struggling this season from three-point land, shooting only .304%, fifth worst in the league. Both struggles can be attributed to the loss of Chauncey Billups, who while his amnesty buy-out enabled them to acquire Chandler and thus improve on the defensive end, the fact he was the team's one true point guard and one of its best three-point shooters has hurt their offense (losing Shawne Williams also hurt their ability to knock it down from outside). 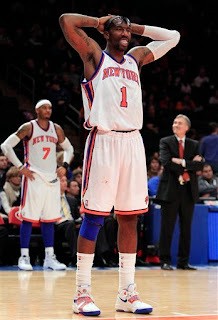 And the single most disappointing player on the team has been Amar'e Stoudemire. Following a season in which he received a lot of praise for stepping up his play and leading the team for much of the year, he has really disappointed this season. With the exception of the 2005-06 season in which he only played three games, he is averaging his lowest points-per-game mark since his rookie season, also the last season he was below 20 points-per-game, he's averaging his lowest rebounding-per-game numbers and he is shooting an awful .412% from the field, which is flat-out terrible for a big man. You can attribute that to him settling for two many jump shots instead of attacking the rim. And his defense has been trash as well. And thus it feels like D'Antoni's days are numbered in New York. Sure you can give the reasoning that it's not a well-built roster as right now they have no point guard, and boy will there be a lot of pressure on Davis when he returns which does not seem that far away, and Anthony and Stoudemire are not well-suited to play with each other as neither makes the players around him better, although Anthony has been doing a decent job as a point forward like I mentioned before. But the bottom line is that this team has been clearly underachieving and that rests on D'Antoni. There is not much question that he's going to be the fall guy as his passive-aggressive style of coaching has not proved itself well this year. And now considering that Phil Jackson is not entirely ruling out that he would be willing to coach the Knicks, you can see the writing on the wall. Who knows, maybe the triangle offense will work with this team since it doesn't rely on a traditional point guard. But it is clear that changes are coming, whether or not the team will improve is to be determined.